Product #21153 | SKU 885954 | 0.0 (no ratings yet) Thanks for your rating! 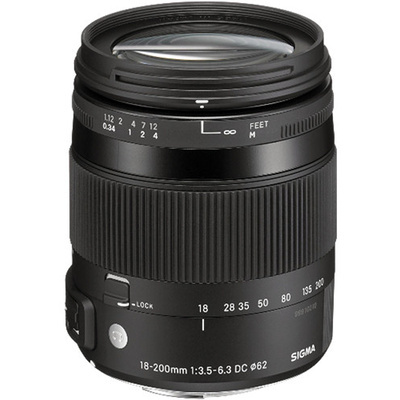 The 18-200mm f/3.5-6.3 DC Macro OS HSM Lens For Canon Digital Cameras from Sigma is an all-in-one lens covering an 11x zoom from wide-angle to telephoto, with a 35mm equivalent focal length of 29-320mm. An optical stabiliser (OS) system is built into the lens, which reduces the appearance of camera shake. This can be especially helpful when shooting at long focal lengths or up-close macro shots. OS also allows you to use slightly longer shutter speeds, making it possible to shoot hand-held in low-light conditions. The built-in Hyper Sonic Motor delivers quick and quiet autofocus.